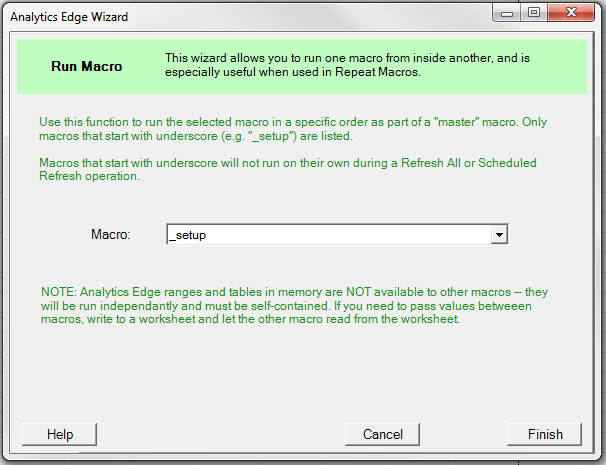 Analytics Edge macros that start with an underscore (e.g. “_setup”) will NOT run when you click the Refresh All button, nor during a Scheduled Refresh. This wizard lets you run those special underscore macros from inside another macro. 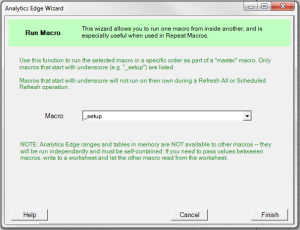 This can be used to create a ‘master’ macro that runs other macros in a specific order. It is especially powerful if the ‘master’ macro is a Repeat Macro. This entry was posted in A. E. Core Add-in on 2015/01/01 by functions.